Andean South America offers significant anthropological insights into highland and arid zone adaptations, including pastoralist economy and ecology, settlement patterns, site formation processes, tool manufacture, and the cultural meanings of landscapes. The papers in this volume present detailed studies of highland and lowland pastoralists and horticulturalists, taphonomy, and sacred landscapes. 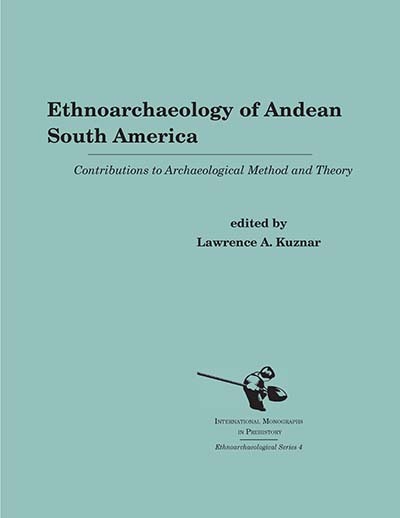 The epistomological foundations of ethnoarchaeology, archaeological uses of ethnoarchaeology, and the relationship between environment and culture are key theoretical themes. This volume will be of use to anyone who studies human adaptations to highland or arid environments, and to those interested in pastoral societies, as well as Andean South America. Lawrence A. Kuznar is a professor of anthropology at Indiana University–Purdue University Fort Wayne.